Traveling cross country learning and refining his technique, winemaker Eric Donaldson settled in Lodi, California. LVVR originated from a small sparkling endeavor for the Vizcarra sisters, since then it has grown into a much larger endeavor. Eric graduated from Miami University, in Oxford, Ohio. Upon graduation, he began working in the Ohio wine industry, starting off the first few years in a couple of wineries in the Cincinnati area. Eric’s first few years were critical to developing a comprehensive understanding of the winery laboratory and cellar. He moved on from the Cincinnati area, also working in a winery near Cleveland. Eventually, Eric decided that it would be best to broaden his horizons and explore what other viticultural areas had to offer. This was yet another valuable experience in itself. He learned a variety of techniques and styles, adding to his knowledge base. Following Sonoma County, Eric’s next stop was in New Mexico. Working with desert grapes provided insight to the next place he would wind up. Eric handled a lot of sparkling wine in New Mexico. The experience offered a lot of insight into warmer climates and their contribution to sparkling wines. The final stop for Eric is here in Lodi, California. He sought out Lodi due to its warmer climate and reasonable cost to start a business. Eric worked at a large winery, again gaining a wealth of knowledge on new equipment and methods, before starting EMD Winemaking. Eric has also completed the UC Davis Extension Viticulture and Enology Program. Whether you are hoping to entertain at home or looking for a great snack on the wine trail, cheese and charcuterie are to wine what the sun, soil and water are to winegrapes! 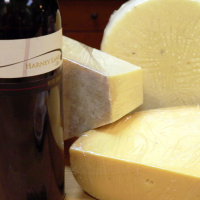 Lucky for you, Lodi has just the shop to fill your cheese needs!